Have you ever met an Angel? Really – I mean it. Sometimes God uses the strangest people, Seriously! Let me start at the beginning. Have you ever been “kicked out” or shunned at a church? Me too. And more people that I know too. So what happens to all of us that God has chosen, yet man doesn’t want to use? Well for a while we stay home. Pout, complain, and have ourselves a pity party. Mine was about 4-6 months as I recall. And then God starts the “wooing” back. Then God sends an Angel your way. Yeah, really. Only he doesn’t look like an Angel at the time. You know, no wings, no harp, no singing. It was New Years Day morning and very cold with lots of snowdrifts in Wisconsin. My husband, Bob, and I went outside to go to work and there was a very drunk man in our driveway passed out on a snow bank. Yep, passed out cold. I went inside and got him a blanket and cup of coffee while my husband tried to get him up. He was breathing, but he wouldn’t wake up. So we called the ambulance. And that of course, sent a call to the Police Department. Well, at that time we lived on a very busy road, but when the sirens came, he woke up! He started shaking, tried talking and just wrapped up in the blanket and started drinking coffee. Then the ambulance came and they brought him to the hospital. I thought ok, problem solved, off to work we went to fix some tv or computer or something. God is so patient. Guess what, that old guy came back 2 more times in the next two or three weeks. And guess what he said each time, “Hey are you going to church? Because they are building an elevator. And I’m collecting cans to help them build it.” Yep. Really. Ok, I know I am stubborn and hard-headed. But, by the third time I got it. And so did my husband. We went back to church – a new church where we could use the gifts that God has given us. And we forgave the people who had hurt us – whether they forgave us or not. We had to let go of the rejection, and the hurt, and pray for them. That God would bless them and multiply them. And you know what? After we went back to church we never saw that man again. No more men in the snow bank, no more men collecting cans. Really. I don’t know if it was the same guy or not. I guess I doesn’t matter. To me he was an Angel. He showed me what I would end up like if I turned away from God – a drunk in the snow bank. And God used him to tell us what to do next. Go back to church and serve. Yep, touched by an Angel! Posted in Spirituality, Uncategorized and tagged Angel, christianity, Church, God, God's calling, hurt, messenger, Rejection, Religion and Spirituality, Spirituality, Touched by an Angel. Bookmark the permalink. 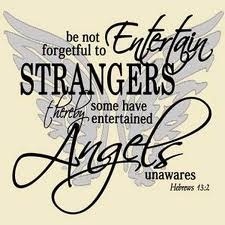 I truly believe I am surrounded by angels every step of the way in my journey. I couldn’t make it without them. Wow what a story you and Bob are weaving together. I look up to you Ms. D. I can’t count the times my story’s stopped at ” Dream about serving again…There are days that’s as far as I get. Awesome post!! 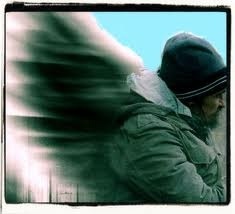 Yes, there are definitely Angels out there doing God’s work and sending God’s messages to those in need. Many blessings to you my friend!!! Oh, there are definitely angels…we just need ears to hear and eyes to see them. Great Blog! This is a great post, I know angels are out there. Lol, yep! Gotta love it!